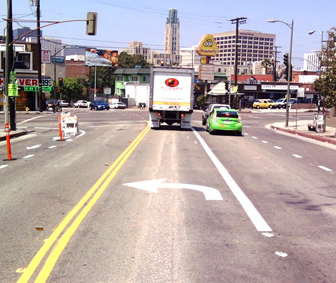 Turn lanes are traffic lanes that allow you to make a right or left turn at an intersection or to a side-road. Turn lanes are controlled by road signs and pavement markings that show you the direction of travel from the lane. 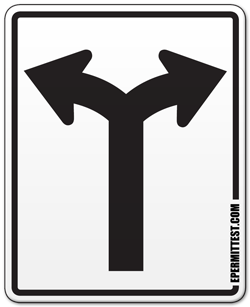 Regulatory road signs that control separate lanes are known and lane use control signs. Intersections with high volumes of traffic may have dedicated turn lanes that remove the turning traffic from the through traffic flow. This usually provides additional safety by protecting turning traffic and reduces the number of head-on collisions at the intersection. Multi-lane roads may also use a center left turn lane outside of intersections to facilitate left turn without slowing down the flow of traffic. Pavement markings at intersections duplicate road signs and control traffic flow through the intersection. 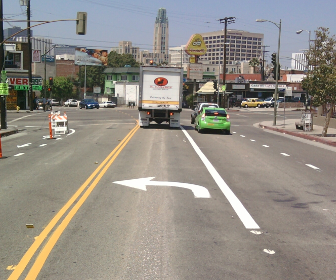 Adjacent lanes are separated by a solid white line. Directional markings, such as arrows and words painted on the pavement, indicate the direction you can travel from this lane. A white arrow pointing to the right or to the left means that you can only turn in the direction the arrow is pointing. The arrow may also have the word ONLY painted under it to clarify its meaning. 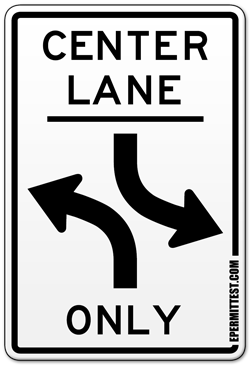 If the lane is marked with a curved and a straight arrow, you can use the lane to either make a turn in the direction the arrow is pointing or travel straight through the intersection. 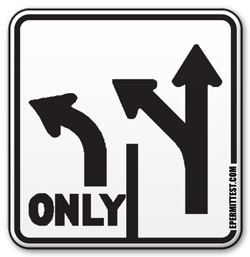 Lane control signs (also known as directional signs) are regulatory signs that show what maneuvers can be performed from the lane. Traffic lane control signs are usually placed near or directly at the intersection, above the lane they control. 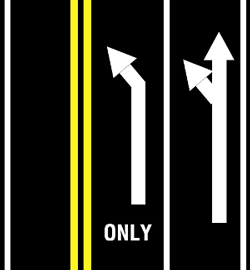 This lane sign indicates that traffic traveling in the left lane must turn left while traffic traveling in the right lane may either turn left or continue straight through the intersection. Traveling in the lane controlled by the sign “TURN TO LEFT OR RIGHT” allows you to make a turn in either direction. Note: you cannot travel straight through the intersection. 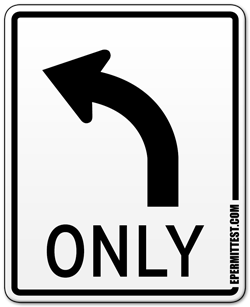 “TURN RIGHT ONLY” is another common lane sign that notifies you that you can only make a right turn from this lane. If you are already traveling in this lane, you HAVE TO make a right turn. 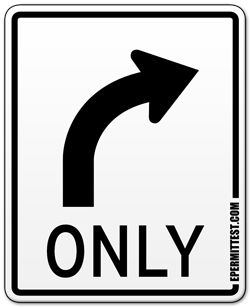 “TURN LEFT ONLY” is similar to the previous road sign, but it requires you to make a left turn if you are driving in the lane controlled by the sign. Dedicated turn lanes are used at busy intersections to prevent vehicles making a turn left or right from slowing down the through traffic. 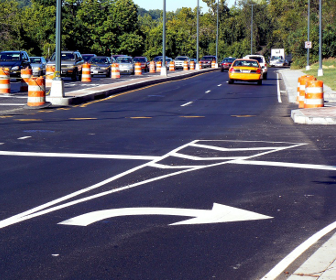 Dedicated turn lanes provide extra space for the turning traffic that essentially takes the turning vehicles out of the general traffic flow. As an added benefit, dedicated turn lanes increase traffic safety at intersections where they are used, statistics showed a reduction in crash rates by as much as 40 percent on some intersection where dedicated turn lanes were employed. A dedicated right turn lane allows you to turn right without slowing down or impeding traffic behind you. Note that you cannot travel straight through the intersection from this lane as you will conflict with traffic moving through the adjacent lane. A dedicated left turn lane allows you to make a left turn without impeding traffic behind you. Some intersections will have dedicated left turn lanes for traffic moving from opposite directions, which will also increase your safety and reduce the chance or a head-on collision while waiting for the turn. 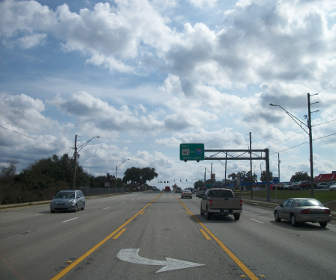 A center left turn lane may be employed on multi-lane road to provide drivers with an opportunity to make a left turn without obstructing traffic traveling straight. 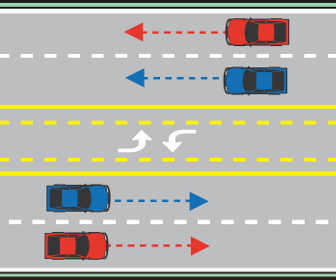 It is also called a shared center lane or a two-way left turn lane, because it is being used be traffic moving in both directions. The center left turn lane is reserved exclusively for vehicles making a left turn or for vehicles entering the road from a side street or a driveway. You are forbidden to travel in this lane, use it as an acceleration lane or to pass other vehicles. Most states limit the distance you can travel in this lane to 200-400 feet. A two-way left turn can be marked by the CENTER LANE LEFT TURN ONLY traffic sign , however special pavement markings are much more recognizable. The center left turn lane is marked by a solid yellow line on the outside and a broken yellow line on the inside . The solid yellow line on the outside means that you cannot use the shared center lane for passing. The broken yellow line on the inside means that vehicles traveling in either direction may use the lane for making a left turn.